Eidos, which is now officially owned by Square Enix. has bravely decided to release the lifetime sales data for the entire Tomb Raider series, showing how well each of the main games in the franchise have performed when you ignore all the little handheld games and mobile phone or DVD spin off titles. So, if you want to go ahead and place bets on which is the best and worst performing title in the series then you'll want to do so now, before we reveal the facts. 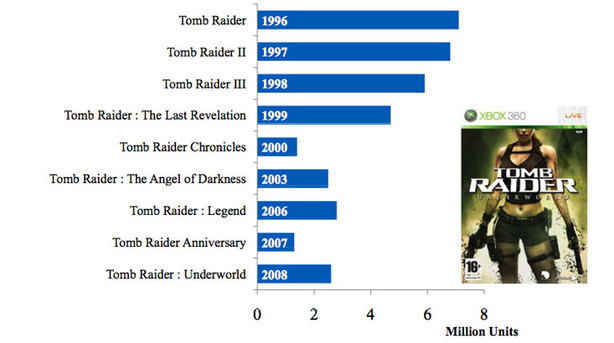 Unsurprisingly, the best selling game in the entire Tomb Raider series is still the first game, which has sold almost 8 million copies across all platforms since it was released back in 1996. Following it in second and third place are Tomb Raider II and Tomb Raider III, setting a trend of diminishing sales that continues until 2003 when the massively panned Angel of Darkness managed to somehow outsell Chronicles. Will wonders never cease? The worst selling game in the series has definitely been 2007's Tomb Raider: Anniversary, which managed to sell under 1.5 million while the titles released on either side are both still rising above 2 million, proving that Underworld actually performed quite well for Eidos. For simplicities sake we've included the sales chart below, originally sourced from Kotaku. Which was your favourite Tomb Raider game? Our was Legend, but let us know your thoughts in the forums.